Gabe in action during FPB's gig on June 25th in Utica, NY at the Utica Masonic Home. Tom, Frank, and Fritz are shown here during FPB's gig at the Utica Masonic Home on June 25, 2011. Mike (mostly hidden) and his PDP drumkit in Utica, NY on June 25th. Frank and Fritz are pictured here during FPB's gig on June 23rd in Oswego, NY. 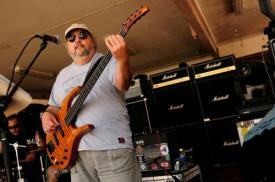 Mike jams along on June 23rd during FPB's gig at the Farmer's Market in Oswego, NY. 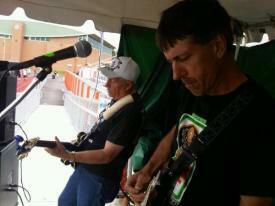 Tom and Frank are pictured here during FPB's gig in Oswego, NY on June 23, 2011. Fritz's Polka Band presents a Jager stretchy shirt to Cassie, who danced a tune with Frank during FPB's gig on June 17th at Crouse Community Center in Morrisville, NY. Tom, Frank, and Fritz crank out a tune during FPB's gig at Crouse Community Center on June 17, 2011. Gabe and his Parker bass during FPB's gig in Morrisville, NY on June 17th. 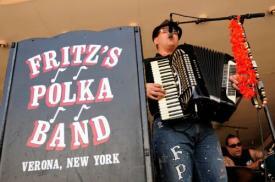 Tom, Frank, and Fritz are pictured here during FPB's gig at Pulaski Park in New York Mills, NY on Jun 14th. Mike is all smiles as he keeps the beat during FPB's gig in New York Mills, NY on June 14, 2011. 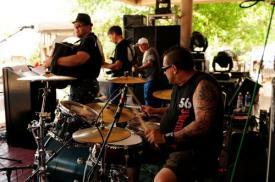 Tom and Frank are shown here during FPB's gig at 'Relay for Life' in Oneida, NY on June 11, 2011.